This week is Save Kiwi week. 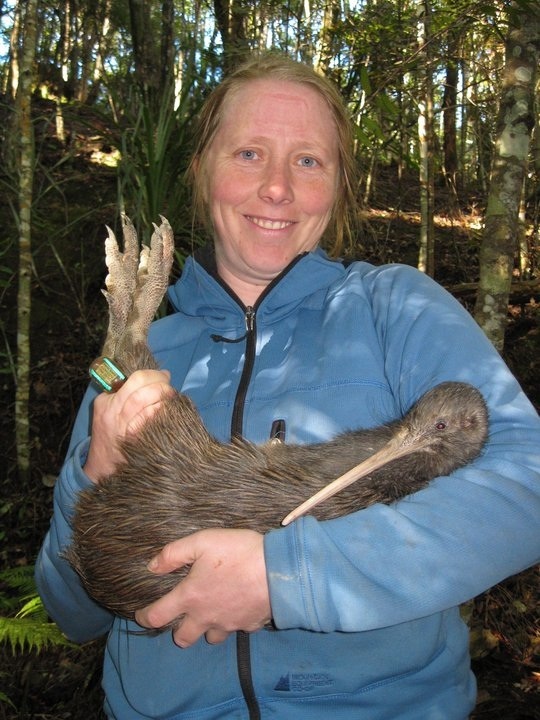 Sarah Jamieson, who previously worked at Massey University studying the breeding ecology and habitat preferences of North Island brown kiwi. Te Papa researcher Sarah Jamieson with an adult female North Island brown kiwi. Photo credit: Kyle Morrison. Alan Tennyson, who led the formal description of a new kiwi species – rowi/Okarito brown kiwi (Apteryx rowi). Lara Shepherd and Alan Tennyson used DNA from bones and skins of kiwi stored in museums to determine the past distributions of each kiwi species before humans arrived in New Zealand. Check out our blogs on the past distributions of rowi and little spotted kiwi. Lara and Alan have also used DNA to try and find out more about some of Te Papa’s kiwi specimens that lack information about where they were collected. Lara and Rangi Te Kanawa were involved in a study using DNA to examine the origin of kiwi feather cloaks (kahu kiwi). Hokimate Harwood has used microscopic analyses of feathers to identify feathers from cloaks, including kahu kiwi.